Burgers. Everyone loves 'em. But have you ever noticed the same names come up again and again when people list off DC's best? Palena is great and all, but how about a little variety? 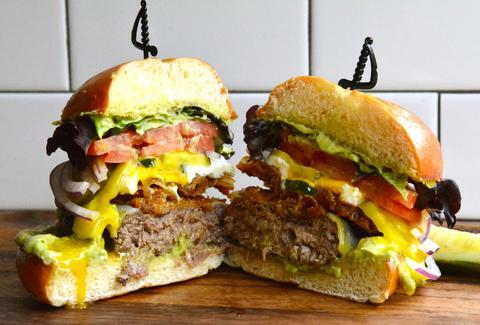 You won’t find these burgers written up in the Washington Post, Zagat, City Eats, Gayot, Burger Days, or even this Eater DC checklist of 35 underrated burgers -- that's how under appreciated they are. They’ve flown under the radar for FAR too long, so start making plans to try them today. Then schedule an appointment with your cardiologist. This burger tastes like a backyard BBQ for good reason -- it’s grilled over hickory chips without even an ounce of help from gas (most places rely on a combo of both). 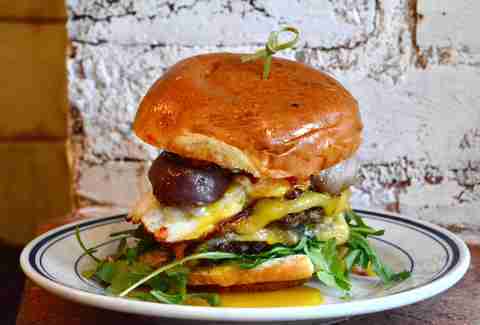 The BBB is topped with inch-thick pork belly, cheddar cheese, and a fried egg. The green chili sauce is the secret though; it’s the product of a friendly multicultural competition among staff members. Let’s talk beef. At DG they use Creekstone Farms, the same stuff served in Michelin Star restaurants in NYC. Piled on top of not one, but TWO patties of haute heifer is smoky Gouda, charred red onions, sweet chili sauce, dill pickles, arugula, and garlic aioli. You can add an XXL egg on top that came from a duck and/or (AND! ALWAYS AND!) house-made chicken liver pâté. 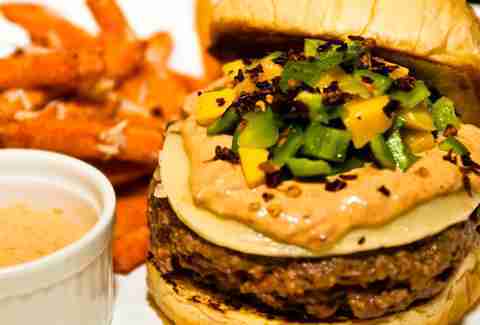 Exacting some revenge on the descendants of Mrs. O'Leary's cow, The Great Chicago Fire Burger is dusted in chipotle before being topped with fire-roasted chili and mango salsa, habañero jack cheese, and chipotle aioli. Fortunately there are about 25 beers for extinguishing your mouth. 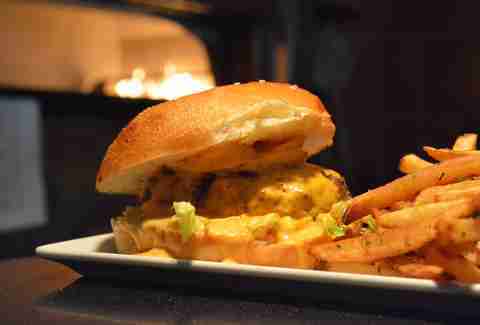 Big Board burgers are also particularly delicious thanks to a marinade inspired by a Navy admiral. For real. People with hammerhead shark-sized smiles are the only ones who stand a chance of getting a top-to-bottom bite of this mile-high burger. You might need to knife and fork your way through Black Angus topped with smoked jalapeño mayo and bread and butter pickles. It gets better: for extra dollars you can add provolone, a fried egg, avocado spread, and gribenes (fried chicken skin!). Quadruple yes. The chefs at this new alehouse are heavy handed when it comes to incorporating beer into their cuisine. 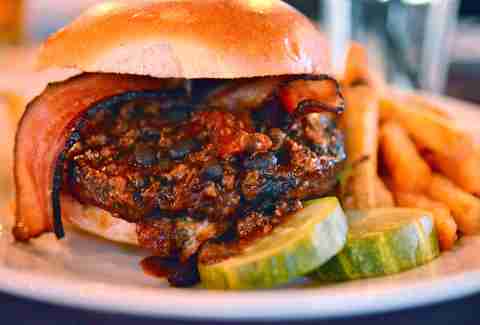 The Teddy Burger, all smothered in Buffalo chili and jalapeño bacon, is topped with a sticky stout barbecue sauce. You should probably eat it with a draft of the same stuff. We’re surprised that the sweet potato halves masquerading as fries haven’t landed a Meridian Pint burger a top spot on a burger list all on their own. 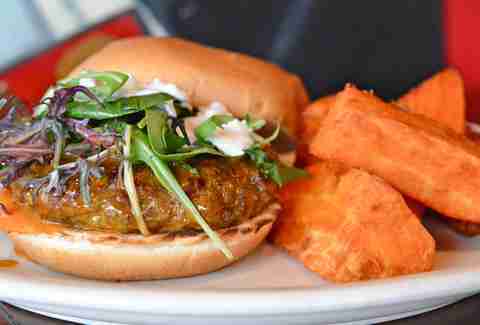 Add a Buffalo sauce-drenched burger topped with house-made bleu cheese dressing and arugula and you’ve got a criminally underrated meal. Bun boredom got you down? 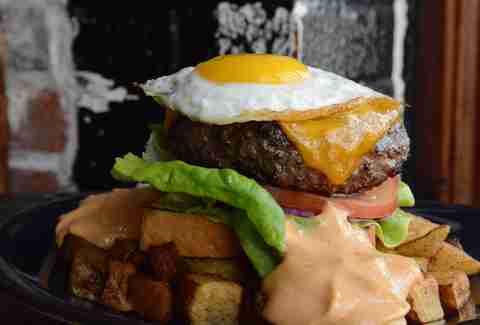 Enter the Brunch Burger, served open-faced on Texas toast. It’s got all the makings of a weekend morning: a sunny side-up egg, Benton’s bacon, and cheddar cheese piled high on top of a patty. The whole thing then sits on a bed of thick-cut breakfast potatoes. Three words: Pimento. Cheese. Fondue. Lately, this cheese creation -- which used to lean a little low-rent -- is gaining a refurbished reputation and popping up on even the finest of menus. 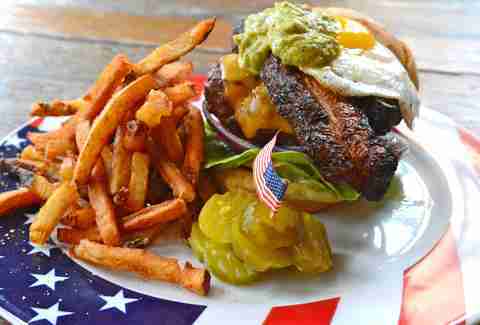 It oozes off the burger, transforming the fries on the side to cheese fries before your very eyes. Bacon-flavored jam always helps, too. This lunch order makes the list based on bacon alone. There’s nothing wrong with mixed mushrooms, Swiss cheese, roasted garlic-Dijon aioli, or farm-fresh egg. But, the bacon is thick, candied, and screams Southern hospitality. 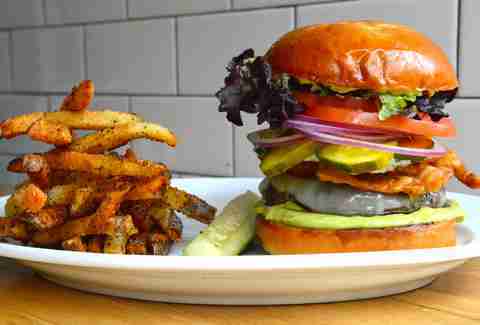 We hope Oprah likes bacon because the chef behind this burger, Art Smith, was her personal chef for 10yrs. 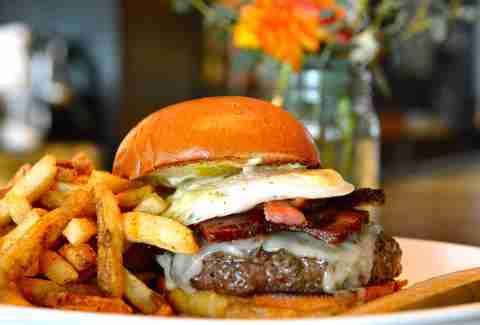 Let’s say you’ve tried all the other burgers on this list and yearn for a taste of the sea. Or maybe you're observing Lent or something. 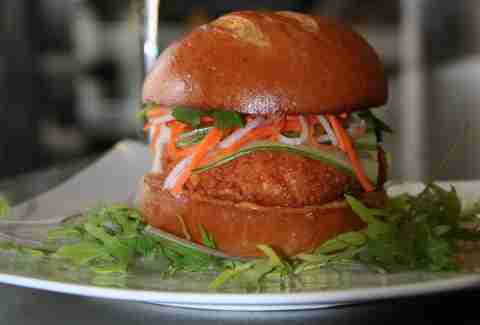 Try a shrimp burger with toppings that mimic a banh mi: jalapeño, shaved cucumber, cilantro, pickled daikon, and carrots. You’ll find this change-of-pace option on Proof’s lunch menu.